Just wanted to make sure everyone heard me that I love lemon and a lemon dessert is a downfall of mine. I can deny most desserts, well more than my fair share of desserts (except for these Red Velvet Crinkle Cookies), especially after one serving but anything lemon it just seems like I can’t. There is no will power when it comes to anything lemon, dessert or not. So back in the 90’s when my parents participated heavily in the Atkins Diet I was pretty much in heaven with the one dessert we got. Yep that was it, that is the dessert we got 6 days a week while they were on the diet. It was maddening delicious for me and I still think about it often. Since I am still thinking about it I had to make it for my own family. I asked mom for the recipe and this is what she sent me. Since they were on the Atkins diet at the time the recipe originally called for a couple of packets of Equal. I will be subbing out for Splenda as I think it is a much better artificial sweetener and I call it a dip now. I don’t mind eating it just as a dessert but my family doesn’t have my fascination with lemon. Calling it a dip is like the middle ground for us, I get lemon and they get cookies. Since we are calling this a dip I usually serve mine with Nilla Wafers, sugar cookies, graham crackers, raspberries and strawberries. Raspberries are a little tougher to eat this with and require a spoon because they are so small, but they are my favorite dipping item for the Creamy Lemon Crystal Light Cream Cheese. Time for honesty here, lemon is my FAVORITE flavor and I am afraid to tell my family that this dip can be made in any flavor of Crystal Light, so if the strawberry banana mix is your favorite flavor than just sub it out. The possibilities are endless really as more companies are making powdered drink mixes. Heck even propel and Gatorade flavorings work just fine just make sure they are pitcher size. Mix whipping cream, Splenda packets and crystal light mix until whipping cream for 45 seconds on medium. You don't want the whipping cream to become whip cream but you want it to stiffen up just a little. Add softened cream cheese and mix until creamy. Serve in small bowls topped with whip cream OR as a dip with your choice of dipping devices. I recommend lemon cookies, Nilla Wafers, sugar cookies, graham crackers, raspberries and strawberries. If you love lemon and cream cheese don’t forget to pin this recipe for later. Perhaps your more of a toffee cream cheese dessert dip or a pumpkin cream cheese dessert dip person. All the above are amazing! 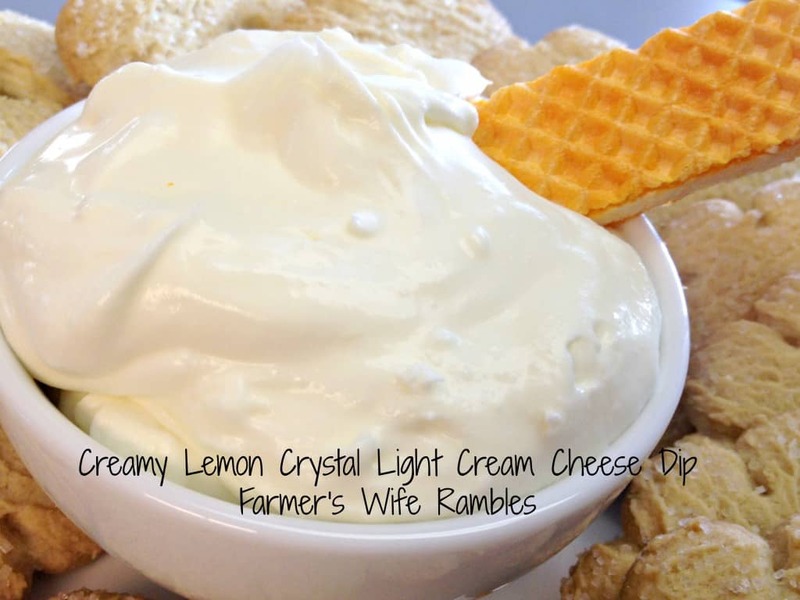 How do you think you will prefer this Creamy Lemon Crystal Light Cream Cheese? As a dip or as a dessert? What is your favorite “diet” dessert? Favorite dip? I think this sounds like a dessert! I am on keto and this looks easy and extra yummy. Oh yeah… this would be so good on chips or bagels… can’t wait to make it. This really looks delicious! I think I’ll try making this. I love the tartness of the lemon mixed with the Splenda. Fresh fruit and cookies like Nilla Wafers are our favorite things to dip with. Enjoy! Oh wow, this looks SO good! I’m like you, I love lemon! I think lemon and cream cheese would be more of a desserty taste for me!